This week the German group of activists and artists, the Centre for Political Beauty, announced that they would exhume the bodies of refugees who died in the Mediterranean Sea and bury them in Berlin. Some of the graves from Sunday's "funeral". “The last rest of the refugees has to be our political unrest”. 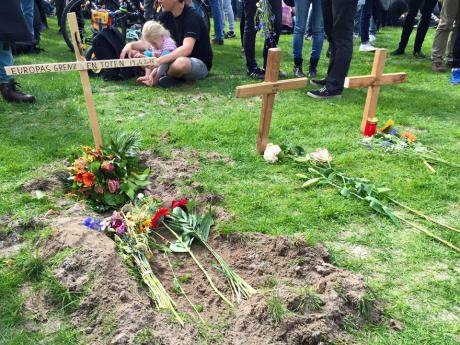 This week, the German group of activists and artists, the Centre for Political Beauty, announced that they would exhume the bodies of refugees who died in the Mediterranean Sea and then bury them in Berlin. With a crowdfunding campaign, which received considerable publicity and raised 47,000 € within three days, the self-made morticians collected enough money to finance this action. By doing this, the Centre for Political Beauty (in Germany well-known as 'Zentrum für Politische Schönheit' (ZPS)) tries to bring attention to the fact that approximately 3,000 refugees have died in the Mediterranean sea this year. They are also highlighting that the victims can often not be identified and are stored in morgues for months, before being buried anonymously. By exhuming some of them, the Centre for Political Beauty tries to raise awareness – not only about the graves, but the refugee crises in general. Approximatively 55,000 refugees have arrived in Italy this year – with Italians calling for increased support from the European Union. Also there were attempts to renegotiate the Dublin-II treaty, which determines that every refugee shall seek asylum in the country where they first arrive. But a quota which is supposed to distribute refugees equally over Europe, is criticised by many countries harshly – especially the UK. Nevertheless, campaigns like this one show that there is quite a large group of people who are actively fighting for better conditions for people arriving in Europe. But building a lobby of refugees was difficult, the refugee dorms (which are called 'camps' belying the negative historical connotations) were spread out over Germany, in the outskirts of cities. Nevertheless, the refugees and supporters began to organise hunger strikes in the camps and initiated a 'refugee march', having Berlin as the destination. The march was rather more of an information campaign, trying to inform the public and build support - it took over a year to arrive in Berlin. In Berlin, the refugees and supporters occupied Oranienplatz and pitched tents there. Additionally, several unoccupied houses, an abandoned school, a trade union office and even, albeit briefly, the famous Berlin TV tower were occupied. During demonstrations and occupations there were severe clashes between the protesters and refugees on one side, and police and local politicians on the other. After a year of protests, negotiations and compromises, the protesters were disappointed about the harsh line by the police, the Green Party (which was acting quite restrained) and broken deals. Some deals, for example conducting a benevolent process in the asylum application of the school occupiers, were not executed as promised. There are also rumours that some refugees feel instrumentalised by white, academic leftists, who are supporting them. Indeed, there is a strong tendency of many students to be engaged in the refugee struggle instead of against general inequality concerns. This has raised the question of who should speak for the refugees - which is obviously not even a homogeneous group. Additionally, the refugees which occupied the Oranianplatz had internal differences with regards to their demands. Despite internal discussions, the refugee movement stands united, since external threats are rising. There is the Desden-based Pegida campaign against the alleged 'Islamisation' of Saxony – a state where only 4000 muslims live. Although less and less people are mobilised, the resentments stay. Local elections resulted in around 10% of the votes going to a Pegida candidate. There is also the right-wing party 'Alternative for Germany' (AfD), which is increasingly winning seats while moving right. Increasing grudges against refugees can also be noticed in crime statistics. The number of attacks on refugee homes increased six-fold from 2012 to 2014, to 150 attacks. Additionally, there are countless crimes on 'foreign looking' people. Just in the last months, several headline-grabbing scandals emerged, when, for example, a future building for refugees was burned down in Tröglitz, Saxony Anhalt, or security guards from a private firm were found to be abusing refugees in a migrant shelter. Although the need for action against xenophobia, resentment and for solidarity with people coming to Europe is clear to many people, there were noticeable critics with regard to the action by the Centre for Political Beauty. On social media, some said the action was disrespectful to the dead, while abusing the corpses for performance art and political campaigning. However, the Centre for Political Beauty underlines that the exhumination, transport and funeral is done in a sensible way. The 'inhumane' graves were opened together with the victims' relatives, who decide what will happen to the bodies once they arrive to Germany. The funeral of the first persons were undertaken on 16 June - also with religious support. The group of activists can already view their provocative campaign as a success. Besides successfully collecting money for the action and raising awareness, thousands of people are supposed to be mobilized for the final funeral procession in front of the Kanzleramt, chancellor Angela Merkel's doorstep. In 2014, they also removed crosses commemorating people who died at the Berlin wall, to bring these to the new wall around Europe (which turned out to be copies). It seems as though not only is the refugee movement gaining momentum, but that the age of unusual and provocative action is about to come (back).